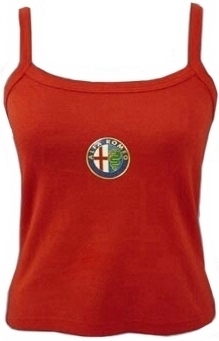 Alfa Romeo Ladies Strappy Top, Red. For those hot summer days this strappy top, with cross over feature at the back is the perfect item. 100% cotton makes the item light and comfortable. Carries the classic Alfa Romeo Logo, printed centre chest. Available in size 2 (36 / 12).